'Lemon Delight' (Bernard Hamner, R. 1972). Seedling# 65-102X100. TB, 32" (81 cm), Midseason bloom and rebloom. 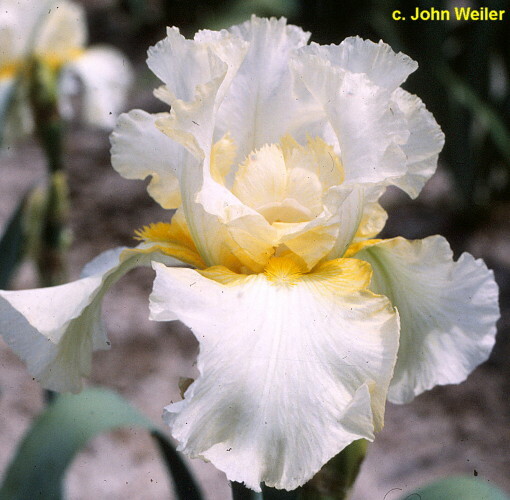 Very light lemon yellow (RHS 10D), yellow (9C) shoulders and beard; ruffled. 'Soaring Kite' X 'Moon River'. Cordon Bleu, Hamner 1973. From AIS Bulletin #209 April 1973 Introducing LEMON DELIGHT: (Hamner 73). TB 30-34". RE. Lovely lemon yellow self. Wide ruffled stands; flaring falls. Reliable rebloomer in Southern California. Soaring Kite X Moon River. $15.00. Hamner's Iris Garden.